Samsung to officially launch Galaxy A3 , A5, A7 (2017) series smartphones at an event in Malaysia on January 5. 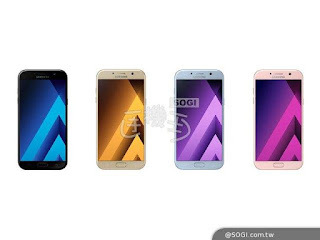 Samsung Galaxy A5 (SM-A5020F) is expected to come in two variant One with Exynos 7850 with 2GB of RAM and another model with Exynos 7880 with 3GB of RAM. The device will run on Android 6.0.1 out of the box. Galaxy A5 to feature a 5.2-inch Full HD Display and expected to come with 32GB of internal storage and 16MP Front and Rear facing cameras. Packed with a 3300mAh battery. Exynos 7880 Processor coupled with 3GB of RAM and 32GB of internal storage.On Camera Galaxy A7 2017 to come with 16MP front and rear cameras. The device runs on Android 6.0.1 packed by a 3500 mAh battery. Samsung Galaxy A series will be IP68 certified water and dust resistant.Samsung Galaxy A3, A5, A7 (2017) will be available in black, silver, gold and Rose Gold color.